Not having made quite enough money yet, Metallica is now looking to rake it in at the box office. And the peasants wept. Some Kind of Monster is an EP, which used to stand for Extended Play -- back in the days of vinyl, EPs were sort of like singles, (only with three or four songs instead of two) hence the "extended." Unfortunately in the days of the compact disc, EP has come to stand for Enhanced Price. Vinyl EPs were often printed on 10-inch discs, midway between the single's 7-inch and the LP's 12-inch size. With CD technology, physical size doesn't matter anymore, and so an EP is just an excuse to jack a few more dollars out of the fans when you don't have enough material for a full album. Compounding Metallica's complicity in this shameless flood of merchandising is the material on the disc. Two versions of the title track sandwich a half-dozen live cuts of songs from the days when Metallica was something more potent than a vehicle for inflating Lars Ulrich's bank balance. The tracks were recorded in Paris in 2003, and include "The Four Horsemen," "Motorbreath" and "Hit The Lights," from 1983's Kill 'Em All, and the title track from 1984's Ride The Lightning and "Damage Inc." and Leper Messiah" from 1986's Master of Puppets. That Metallica no longer makes music of this complexity and power, and has in fact distanced themselves from their earlier work, apparently makes no difference, nor does the fact that the band could as easily have released an entire live album from the Paris shows and given the fans a considerably larger bang for their buck. 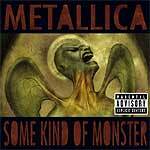 In fact, it's the new song, "Some Kind Of Monster," that illustrates most pointedly what's gone wrong. It's basically a rap metal track, and it shows that the band is so far gone it's trying to cash in on a trend that's already dead. Indeed, where it was once a snarling and fearsome beast, Metallica has become "Some Kind of Monster"... a money monster -- instead of a musical monster.